For information, photos, and resutls please join us on the Big Chop's Facebook page. We're also on Instragram and twitter too. Click on the links below to get social with us. 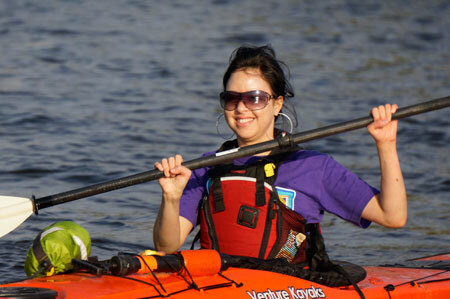 LEARN TO PADDLE WITH MEC! IT'S A WRAP! SEASON #9 ENDS IN A SUPER WAY. 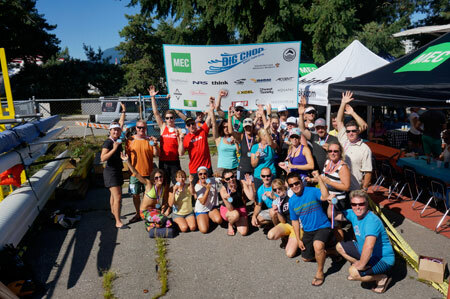 Clear blue skies and hot summer weather were the order of the day for the final race of the MEC Big Chop Summer Paddle Series. The "Super Chop" saw 100 paddlers take on either the 3K, 7K or 15K course and it was Nancy Dixon, Carolyn Daubney and Wes Hammer winning, respectively. Full results here. The Big Chop woudl like to extend a BIG thanks to everyone who supported us this year. 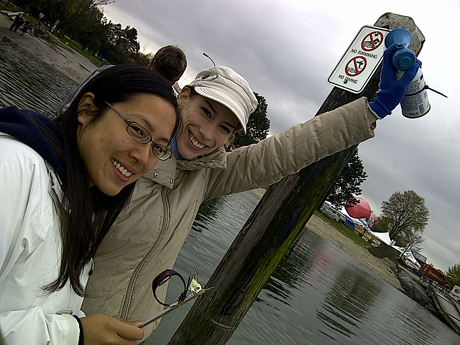 Thank you Vancouver Ocean Sports for hosting us, MEC and all of our sponsors for all of the amazing prizing, and Fraser Riverkeepers for teaching about water quality in Metro Vancouver. 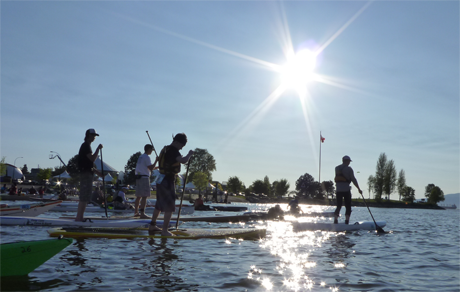 We saw record numbers on the start line all season and and impressive increase in the number of paddleboards too. 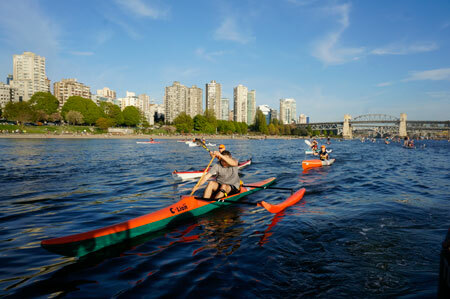 We love the fact that the Big Chop continues to see so many new paddlers come out for the Big Chop experience. Thank you again and we'll see you next May for our 9th season! 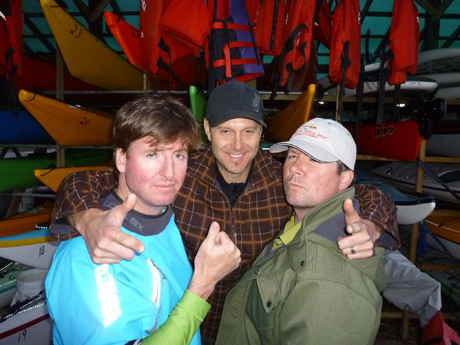 Bryan, Stu & George -- your race directors! 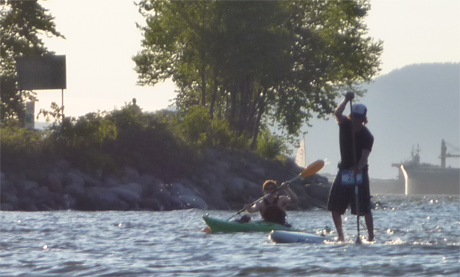 It was another great night at the 84th MEC Big Chop Summer Paddle Series. 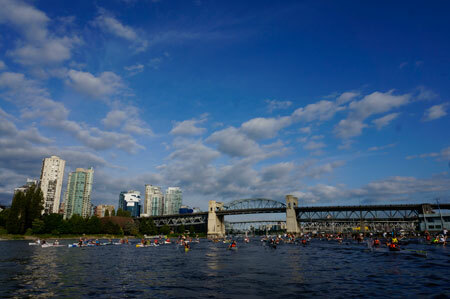 The skies opened up and it was filled with blue skies and 100+ paddlers on the start line. 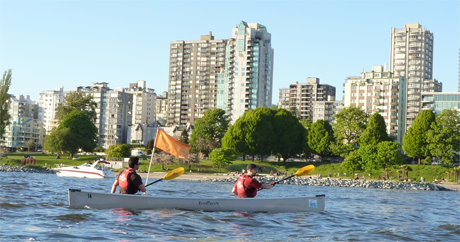 It was awesome to see a row boat and a canoe with three enthusiastic paddlers ripping it up. .
What a start to our 8th season of the MEC Big Chop Summer Paddle Series! The skies were blue and temperatures were in the 20's so we expected a solid turnout. However, to see 110 paddlers on the start line was something else for our first race of the year. 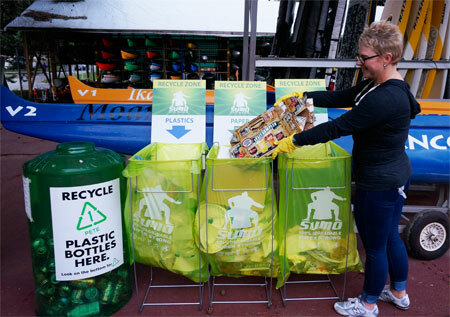 There was a definate increase in the number of paddleboarders on the start line and a bunch of new faces in the surfski and outrigger categories. National level paddler, Corey Hamilton, edged out Shane Martin for the win in the Big Chop and Sarah Hamilton (are they related?) 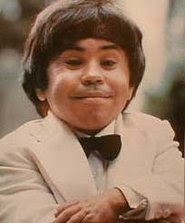 won the Little Chop. Results here. A full photos gallery is on Facebook. The next race is on May 15th and we'll be doing the Surfer's Loop! See you there! Here's the course map for Thursday night's race! 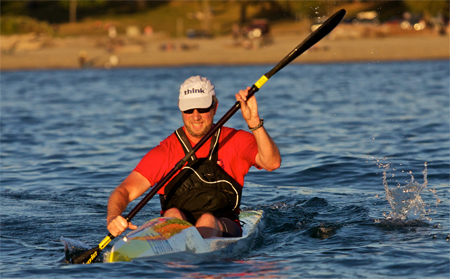 Hope to see you all out for the first race of the MEC Big Chop Summer Paddle Series! Remember that you can register for the entire series which includes all 10 races and a souvenir race shirt. THE BIG CHOP SPONSOR TEAM! The sponsorship drive is now complete and I just want to say "WOW!" 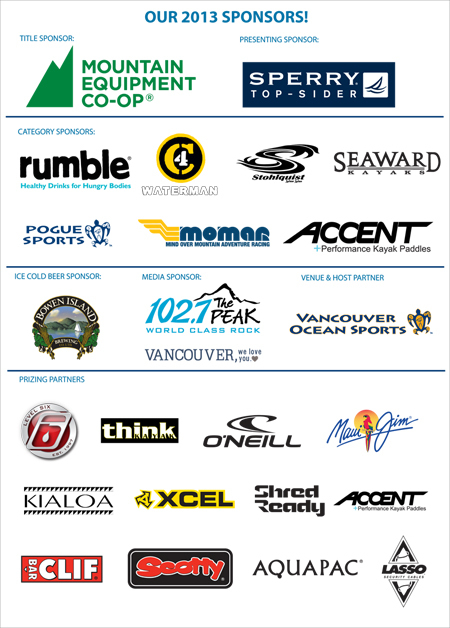 The response from the paddling industry was record breaking and we have over 25 sponsors/partners for our 7th season. MEC is back for its 7th year as our title sponsor and we're very excited to announce the additon of Sperry Top-Sider as our new Presenting Sponsor! Remember those boat shoes from years back? Well, they're back along with a big catalog of great apparel. The prizing table will be nothing short of incredible. Some of the big year end grand prizes include a kayak from Seaward, a SUP board and paddle from C4 Waterman, more paddles from Kialoa, Accent and Think. And, of course, MEC is throwing in a $500 shopping spree! Many of the sponsors will be out participating in the Big Chop and/or setting up a sampling table on race nights. Our new friends from Rumble will be there for sure sampling their new healty drink product and Clif may make an appearance too. Three cheers for all of of our sponsors!!! 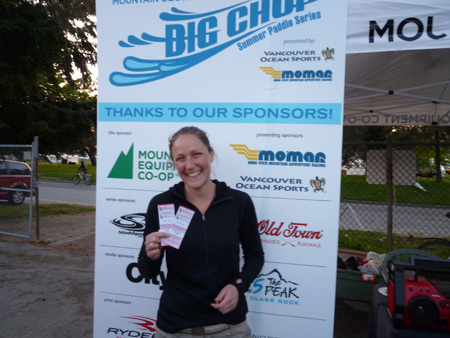 Online registration for the Big Chop's Series Pass or just the Super Chop finale is now open. 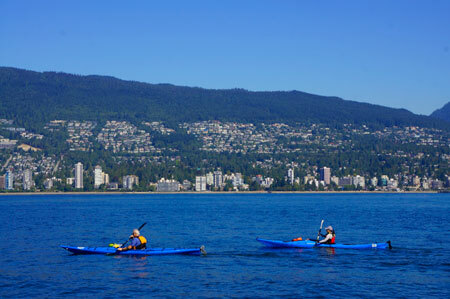 * Once you're signed up for the SUPER CHOP, then you can also reserve one of our rental kayaks, SUP, canoe, or surfski. This is done on a first come, first serve basis but you MUST be signed up first. 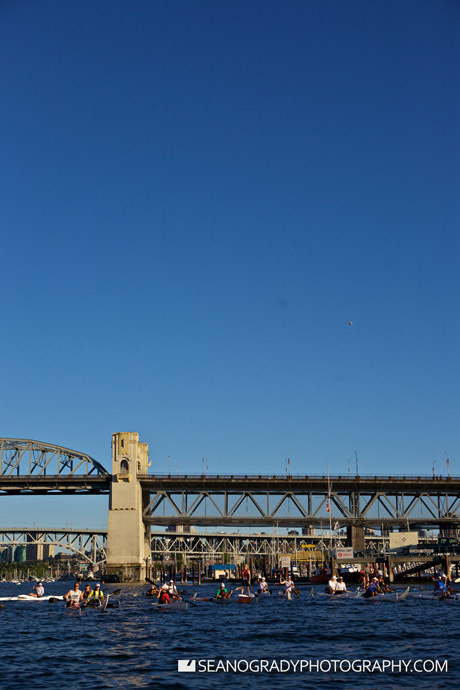 To book your boat, email Jeannie at rentals@bigchop.ca. And if you just want to come out for any one of the first nine races, then you can simply register on race day starting at 6pm. BIG CHOP'S FINAL RACE TO MOVE TO "SUPER CHOP" SATURDAY! 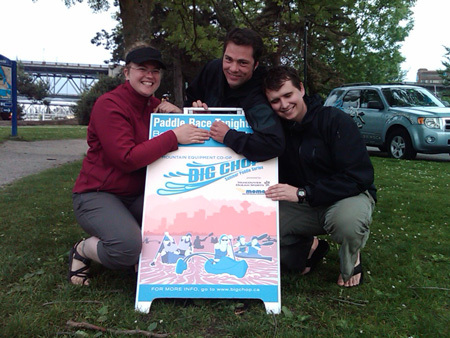 To celebrate our 7th seasion, the Big Chop Summer Paddle Series is changing things up! In partnership with Mountain Equipment Co-op, the Big Chop is proud to announce the expansion of the series to include a season ending “Super Chop” paddle-sport race. 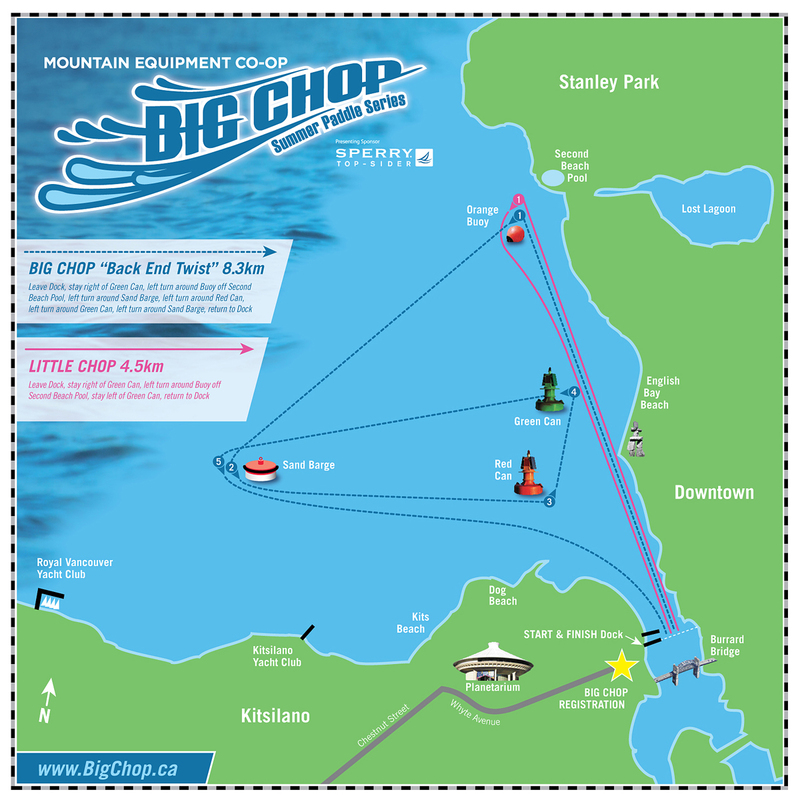 On Saturday, September 14th, 2013, the Super Chop will be the tenth and final race in the Big Chop series and will feature three course distances: 3km, 7km and 15km. 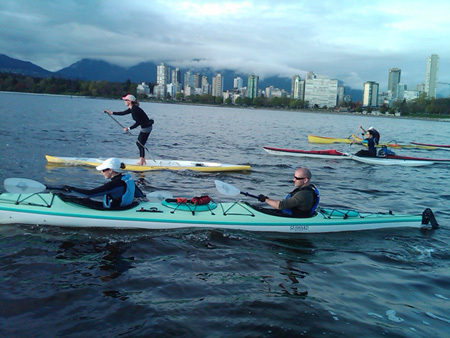 Participants can paddle any type of non-oarlocked or non-motorized craft including a kayak, surfski, outrigger, canoe or standup paddleboard. 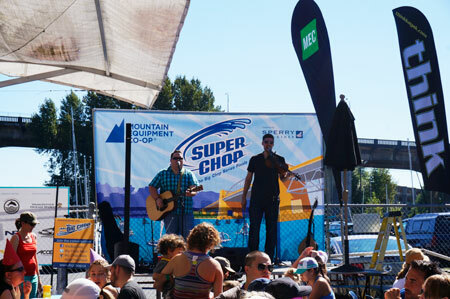 The Super Chop will will be a full day of festivities including a super BBQ lunch, cold beer and live music. Of course, we'll be giving away heaps of draw prizes including some BIG GRAND prizes. 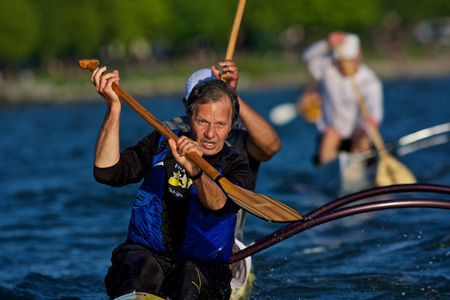 Organizers are expecting to have 300 paddlers, including some of the sports top racers from across the continent, on the start line which will make it the largest multi-boat paddle race in Canada. More race details can be found here. The Super Chop is preceded by the regular Big Chop season that begins on Thursday, May 9th, and continues every second Thursday until August 29th. 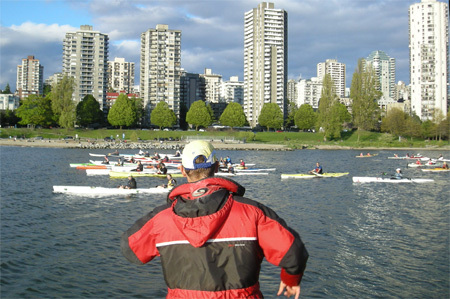 All races start and finish from the Vancouver Ocean Sports compound located in Vanier Park, Vancouver, BC. The complete schedule is now posted and online registration for the series pass and the final Super Chop will be available on April 1st. Please help us spread the word and tell your paddlling friends! 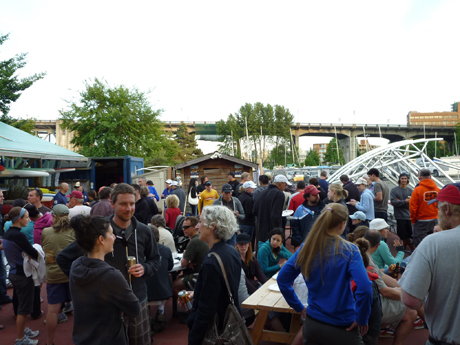 THE BIG CHOP ENDS WITH RECORD TURNOUTS AND AMAZING BLUE SKY NIGHTS. What a way to end our record breaking season than with blue skies and an all time record turnout. 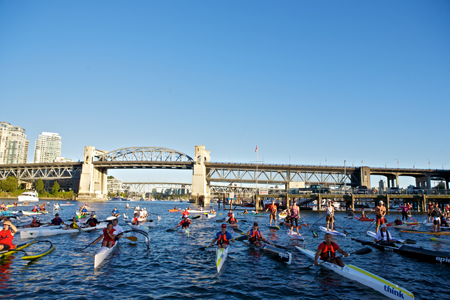 There were 85 boats and 103 paddlers on the start line for the final race in the MEC Big Chop Summer Paddle Series. All boat categories were well represented (except for the good old canoe and the rowboats) and we were all eager to rip throught the sunset course so we could head over to the Rocky Mountain Flatbread Company for our annual windup party. These photos were take by Sean O'Grady and I've posted many more on the Big Chop Facebook page. I'll also post the full gallery in the next few days too. 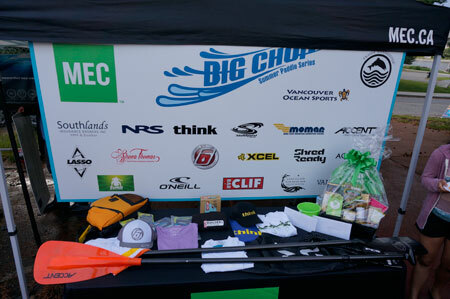 We would like to say a BIG thanks to everyone for coming out and supporting the Big Chop especially the volunteer team from Vancouver Ocean Sports and MEC. 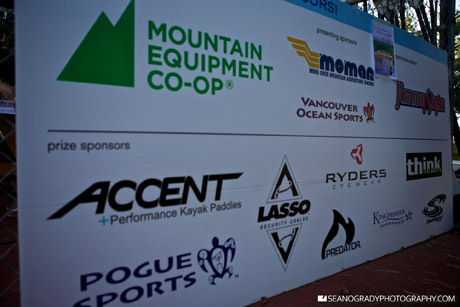 Of course, the event couldn't happen without the generous support from our amazing team of sponsors: Mountain Equipment Co-op, Stohlquist, NRS, Seaward Kayaks, Accent Paddles, Bowen Island Brewing Co., Kialoa, Level 6, CLIF Bar, Lasso Cables, Think Kayaks, Deep Cove Kayaks, Pogue Sports, Mind Over Mountain Adventure Racing, and Vancouver Ocean Sports. I'll do another blog post from the Series Party as soon as I get some photos. Sure, it was a bit wet out there tonight, but it was awesome paddling weather for the 70 paddlers who wore a few extra layers and took on the fun at tonight's Big Chop. This was race #5 and we're now halfway through our season. We've had record attendance this year and the vibe at the race is fantastic. Tonight, we gave away a ton of great prizes including some some new swag from Level 6. No photos tonight but I'm hoping Sean O'Grady will be out at the next one! 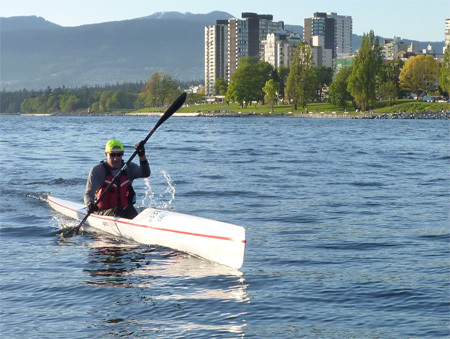 Bob Putnam from Deep Cove Canoe and Kayak Centre is coming out early on Thursday before the Big Chop with a few Think Kayak surf skis for you to demo. 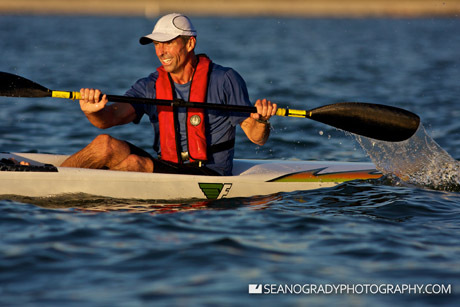 Both Bob and Daryl Remmler (Think) will be on hand to give you paddling tips that will help you go faster. 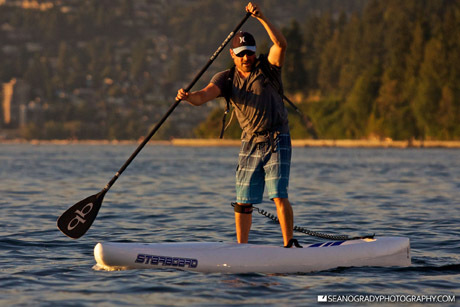 Deep Cove has the newest batch of Stable, lightweight surf skis. Fast, fun to paddle and Stable. Did I say Stable? 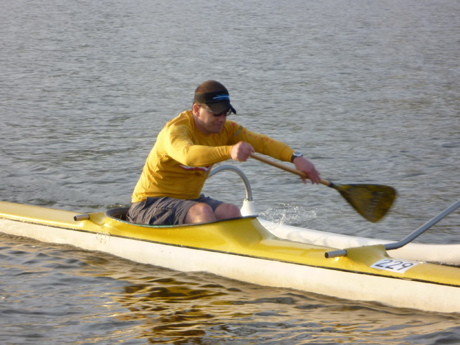 Some surf skis are stippy but THINK Kayak's new EZE can be paddled by everybody. Come and give one a try. May 31 at the Big Chop. We'll be set up at from 5:00 to 6:30pm and after the race too. We'll have: 2 Think EZE, 2 Think EVO, and 1 Think Legend. 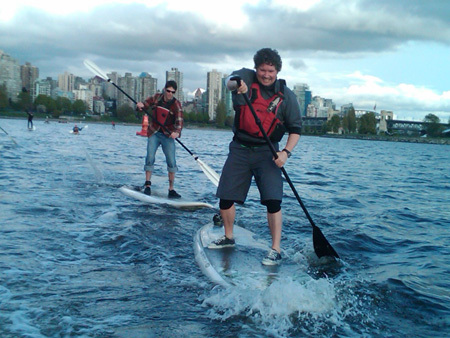 Did you know that we have Think surfskis that you can rent for any Big Chop night? Graham Galves looking fierce on the OC2. What a night, what a sight. 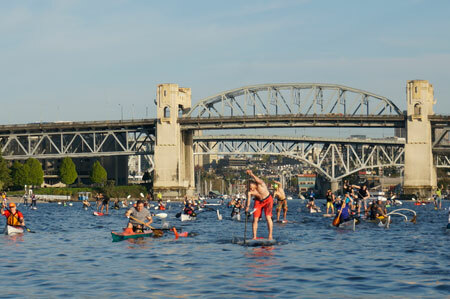 Over 100 paddlers were on the water for the second race in the MEC Big Chop Summer Paddle Series. 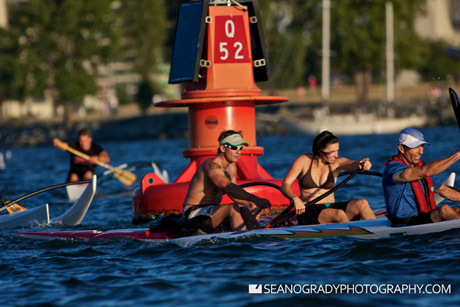 The start line was a mix of kayaks, outriggers, surkskies, and SUPs and boats were spread out across the channel. 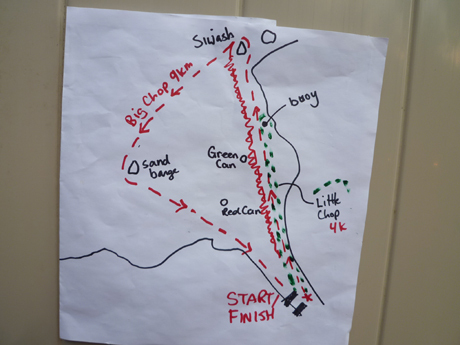 The course took paddlers out to Second Beach and then a loop of the Sandbarge, Red Can, and Green Can for a distance of 8km+. It was Shane Martin crossing the line first (again) beating out the likes of Alan Carlsson, Warren Bruce, and Eric Fast. We have a great set of photos taken by Sean O'Grady and I've posted the gallery on the Big Chop's Facebook page. If you're interested in a high res copy, please contact Sean directly. Thanks to all of the racers, volunteers, and sponsors for supporting another great night! WHICH VANCOUVER CANUCK WAS AT TONIGHT'S BIG CHOP? 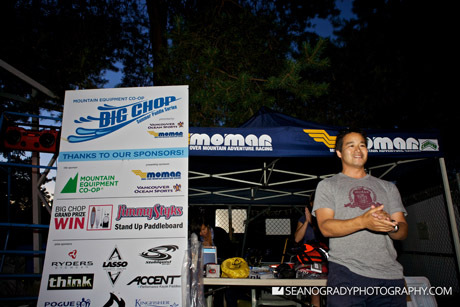 Vancouver Canuck defenceman, Dan Hamhuis, at the Big Chop. 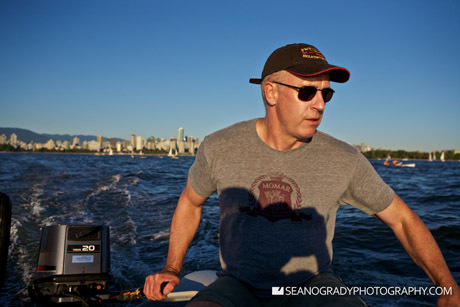 Photo by Sean O'Grady. Yep. 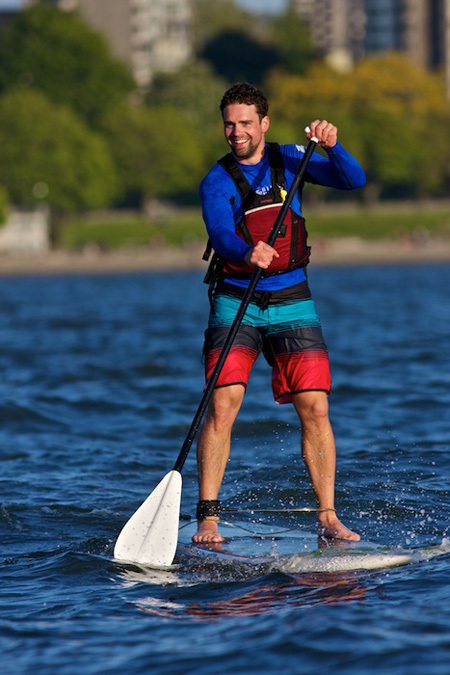 Fan favorite, Dan Hamhuis, defenceman for the Vancouver Canucks, took part in tonight's MEC Big Chop Summer Paddle Series. Paddling 5km on the Standup Paddleboard, Dan and his buddies, battled wind and a slightly choppy ocean to complete the race along with 101 others -- a record turnout for the Big Chop. Results and more photos to follow tomorrow. See you all at the next one on May 31st. NRS JOINS THE BIG CHOP! 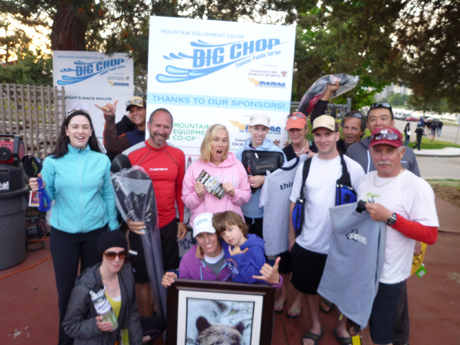 WIN A SUP AT THE BIG CHOP! We have a brand new sponsor joining the Big Chop and their name is NRS. The company makes a very unique line of inflatable SUP boards -- yes INFLATABLE! As a Series Sponsor, NRS will be donating the Big Baron model that we'll give away at the end of the season. Terry from NRS will be out at the next Big Chop too with an extra one for you to test out. The inflatable NRS Big Baron's unique construction lets you add up to 15 psi air pressure for rock hard rigidity. And, at 3 feet wide and over 11 feet long, it's super stable even in rough water. Grippy textured deck, interchangeable fins, and includes pump, pressure gauge and carrying backpack. For fun on the water, just add air. Of course, if you like one, walk down to your local MEC and pick one up, throw it in your back pack and run to the water! GRAND PRIZE CONFIRMED FORTHE BIG CHOP FINALE. 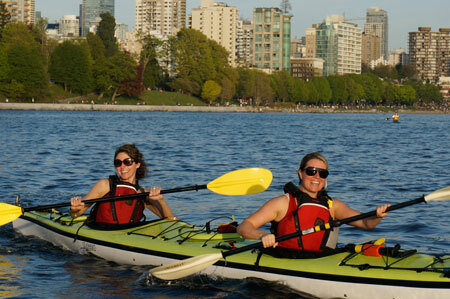 We are very excited to announce that Seaward Kayaks has signed on to be our Grand Prize Sponsor for this year's Big Chop. 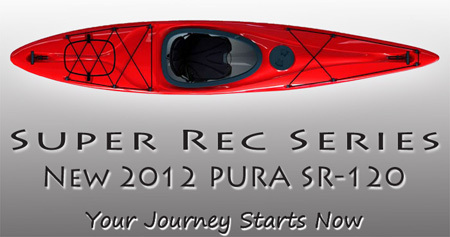 The prize is a SR series Kayak and we'll award it randomly to one lucky participant at the Series Awards on Sept 6th. These boats are stable, light, and lots of fun. You can choose between any boat in the SR series. To win, all you need to do is race a Big Chop and you will get an entry to the draw. The more you race, the more entries you get! Seaward was a sponsor in the first few years of the Big Chop and we're thrilled to have them back. 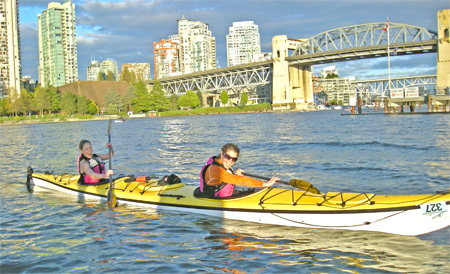 We've had a rental fleet of Seaward Passats for the Big Chop and their one of the best double kayaks around. Fast and comfy. Love them! RECORD TURNOUT FOR THE FIRST RACE OF THE BIG CHOP SEASON. 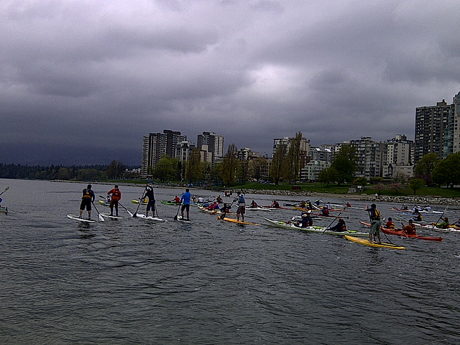 The clouds parted and blue skies peeked out for the first race of the MEC Big Chop Summer Paddle Series. 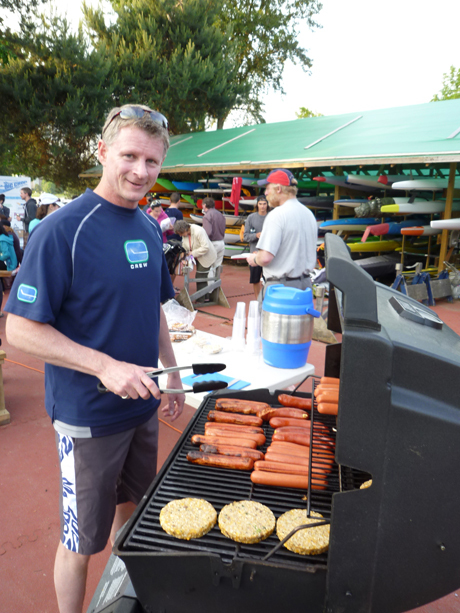 We had a record turnout with 65 paddlers on the start line and it was Shane Martin who was the fastest boat on the water. The course was out to the 'sand barge' and back (double loop for the big choppers) for a mere 7.8km. It was a great mix of OC, Surfskis, kayaks, and SUP all going head to head. Next race is on May 17th. We'll have even more prizes for that race so you won't want to miss it! More photos on the Big Chop Facebook page. CHOP CHOP. YEAR SIX IS SET. GET YOUR PADDLES READY. 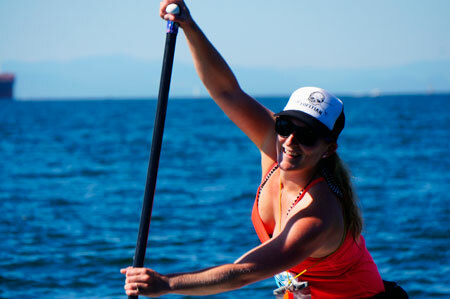 The 2012 schedule is now up for the 6th annual MEC Big Chop Summer Paddle Series. 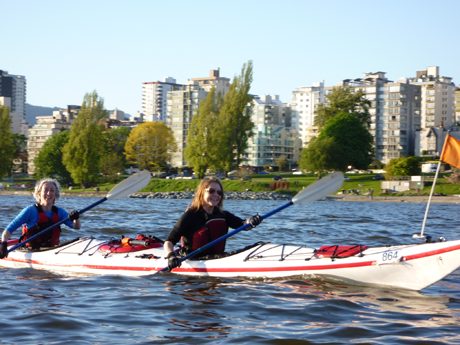 The 10 race paddle race season kicks off on Thursday, May 3rd so mark the date on your calendar, book your babysitters (Louise/Jeannette), and we'll see you there. We'll have the fleet of rental kayaks and Stand Up Paddleboards available at each race and you might want to give one or the other a try this year. 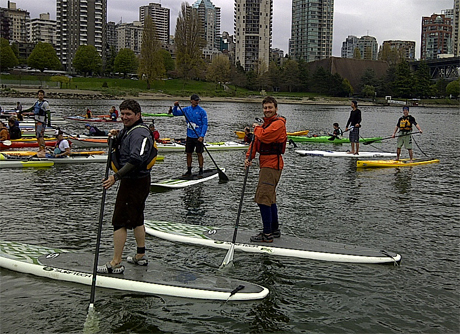 It would be great to see all of the SUP out on the start line for every race. We're starting to work on securing our sponsors and a shed full of prizing that you've come to expect every year. If you know of anyone who might want to join our team of sponsors, please send us an email and let us know. CELEBRATING FIVE YEARS AND 50 RACES, ANOTHER BIG CHOP IN THE BAG. 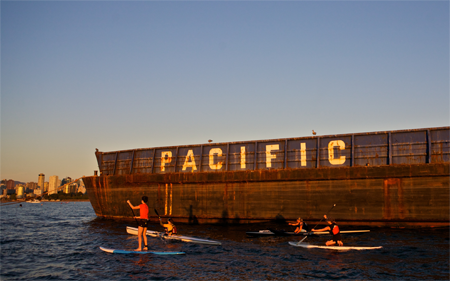 Another season of the MEC Big Chop Summer Paddle Series comes to close as we celebrate the end of our 5th anniversary. 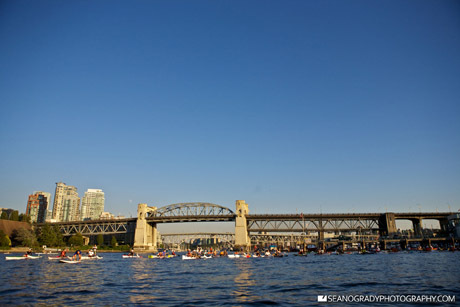 Close to 90 paddlers took part in the race around the sandbarge which was also the 50th Big Chop since we began back in 2007. 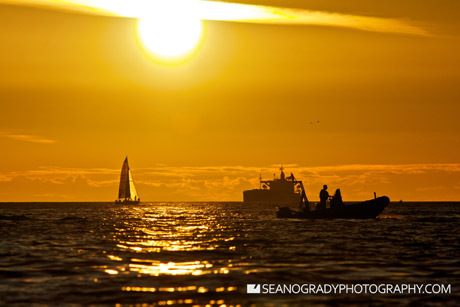 There was no better place to be during our September heat wave than on the water and with the sun setting, Sean O'Grady captured another amazing set of photos from the race. Shane Martin won again! I think that made it eight for eight. 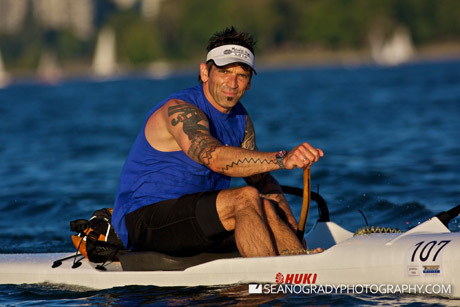 Think Kayak's Darryl Remmler captured a third place finish in the Little Chop and did on a SUP. 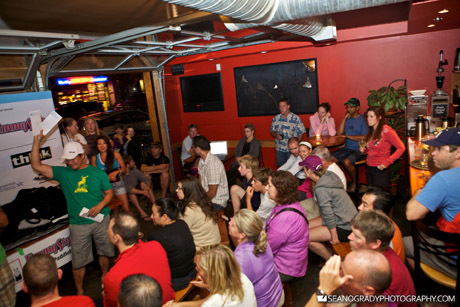 After the race, everyone headed to the Rocky Mountain Flatbread Co for the Series Party. Racers and volunteers ate pizza and drank beer and we gave out a table full of prizes including the Jimmy Styks SUP kit, a MEC mega prize, a weekend stay at the Kingfisher Resort & Spa, a Think wingblade paddle, and many other prizes from our incredible team of sponsors. 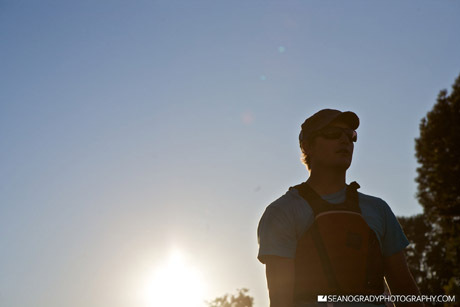 You can view all of the photos on Sean's FLICKR page. If you would like a high res copy of the photo, simply email Sean with the complete file name. PHOTOS FROM THE BIG CHOP BY SEAN O'GRADY. 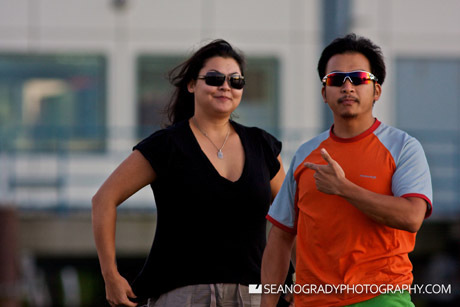 Big BIG thanks to Sean O'Grady for coming out and taking photos at the last Big Chop. Here is an amazing set of images for you to check out. I've posted the rest on our Face Book Page. 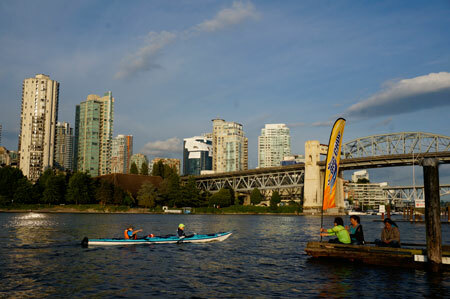 Sunny skies graced us at the penultimate race of the season and so did 70 enthusiastic paddlers. 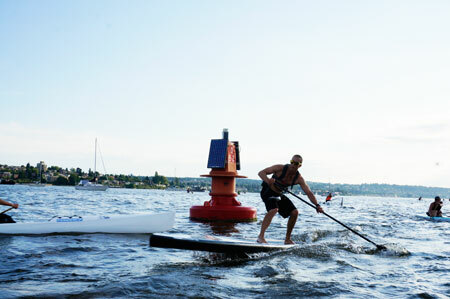 It was a great mix of SUPs, outriggers, kayaks, and surfskis, but once again it was Shane Martin taking the overall win. 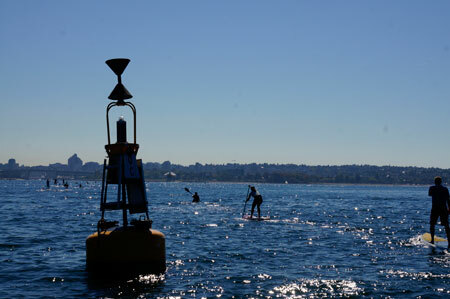 It was great to see a good contingent of SUP out there --11 in total-- and to see them do so well in the Little Chop. 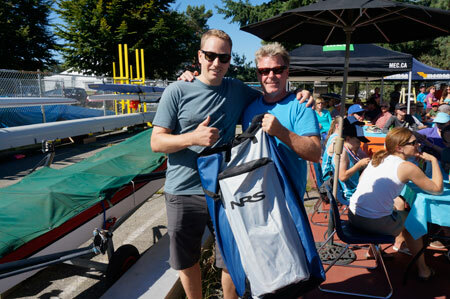 Sean Gibson and Dale Rollings paddled their double kayak to a first place finish but Mike Darbyshire and Think Kayak's Darly Remler took second and third overall while paddling their SUPs. We were fortunate to have Sean O'Grady out taking photos this week and I'll be posting up his gallery as soon as they come in. 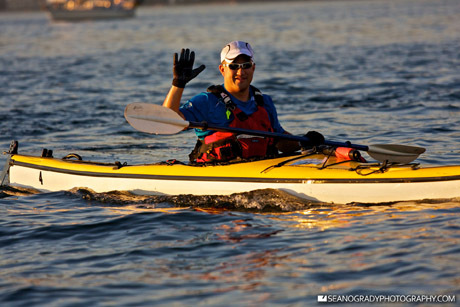 Sean will be out for the final race as well so be sure to do your hair, wear your best paddling gear, and smile for the camera! And speaking of the next race, that would be the final one of our FIFTH season! 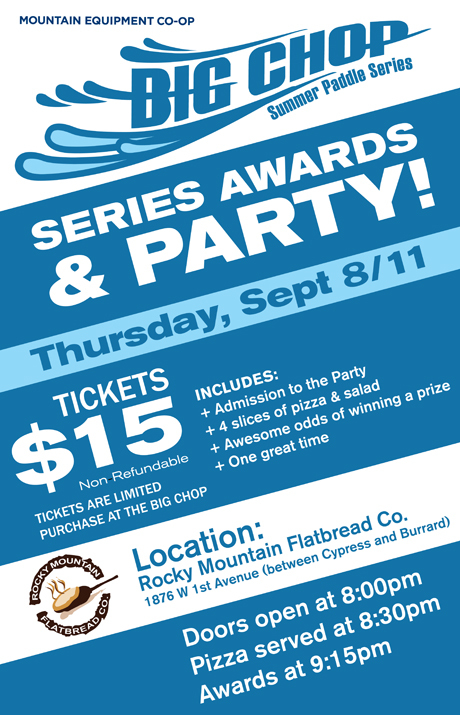 Remember that immediately following the race, we'll all head over to the Rocky Mountain Flatbread Co for the series awards and party. We still have a few tickets left and you MUST buy them duriing regisration. EIGHT DOWN, TWO TO GO. 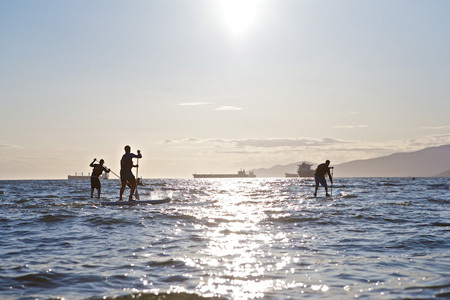 A spirited group of 40 paddlers hit the waters for week eight of the MEC Big Chop Summer Paddle Series and it was another spectacular night to travel out to English Bay. 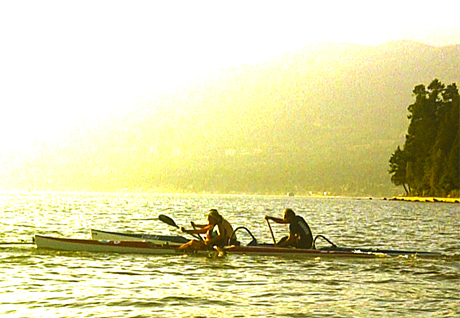 Paul Hansen in his Surfski took the Big Chop over the tandem containing Marshall House and Curtis Brock. And Matt Insley took the Little Chop title for the night. 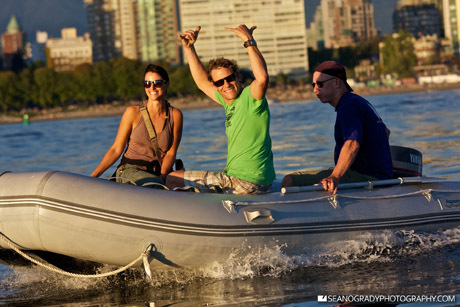 Thanks again to the amazing team of volunteers from Vancouver Ocean Sports and MEC. You guys are awesome! 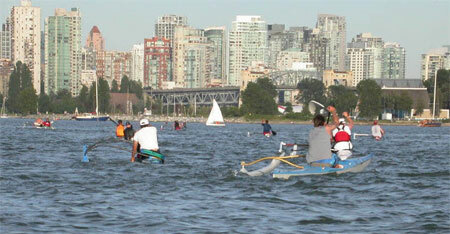 The kayaks are bookign up very fast so we're expecting a good turnout for race #9 on the 28th. I hope to you out there too. SERIES PARTY TICKETS ON SALE THURSDAY. It's getting close to party time! Tickets for the Series Party & Awards will go on sale at this week's Big Chop. We are only selling 90 tickets and we expect most of them to be sold well in advance. We'll be giving away a ton of great prizes including the Jimmy Styks SUP package, a Think wing blade, and a weekend stay at the Kingfisher Resort and Spa! Bring an extra $15 on Thursday and mark the night in your calendar! This week's Big Chop fell on the eve of the Canada Day long weekend and judging by the turnout, I guess many were out of town. Even the two Race Directors weren't able to make it as Ryan was up in Whistler for a stag and Bryan was working late setting up the Surrey Canada Day festival. 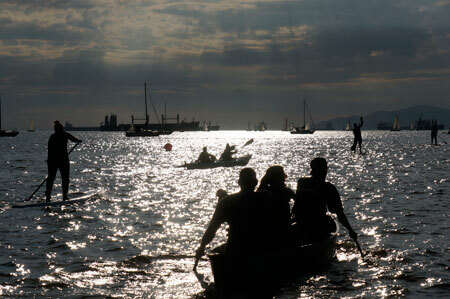 Still, 34 paddlers showed up on a beautiful evening in English Bay. Congrats to Shane Martin for besting Cam and Mike Fitzmaurice by one second for the overall win in the Big Chop. It was same scene in the Little Chop with Xavier Hamonic winning by one second over Khai Lee. Norm Hann was out on his SUP and took on the Big Chop. Norm specializes in expedition trips to the Great Bear Rainforest via is company Mountain Surf Adventures. 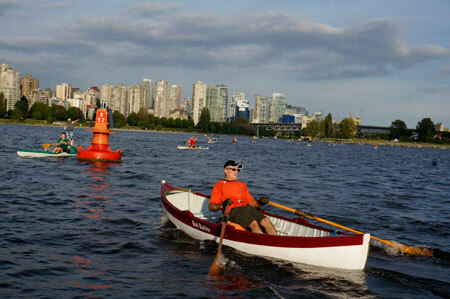 The next race is on July 14 and we hope to see a return to a big fleet of paddlers on the start line. We will be giving away 6 pairs of Ryders polarized sunglasses at this race. And big thanks to Jeannie for running the show without us! PUTTING THE 'BIG' IN BIG CHOP. 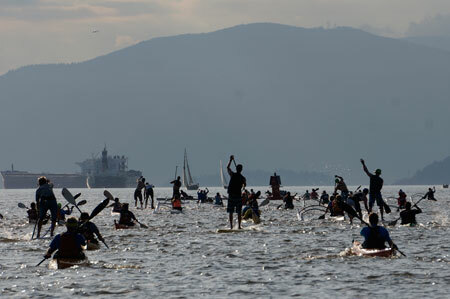 OVER 80 PADDLERS HIT THE WATER OF ENGLISH BAY. Group photo of all of tonight's prize winners. 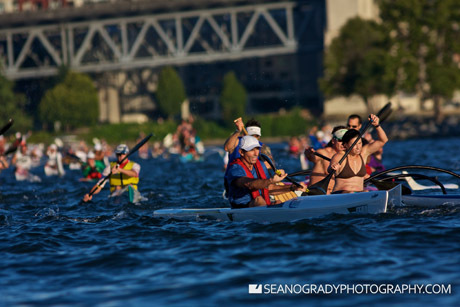 Over 80 paddlers came out for the fourth race in the MEC Big Chop Summer Paddle Series. Aside from the series finale, this is the biggest turnout in our five year history. Lots of new faces at the Big Chop tonight too which is always great to see. 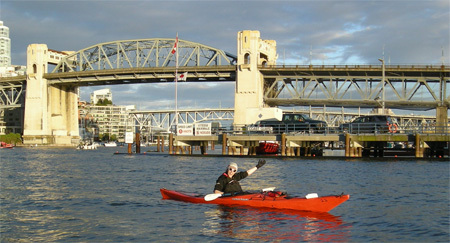 Ryan Pogue decided to offer a new race route out to the marker by Siwash, to "Sand Barge" and back. 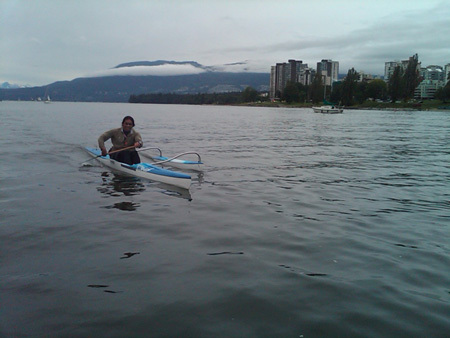 The course distance was over 9km with the Little Choppers paddling approximately 4km. 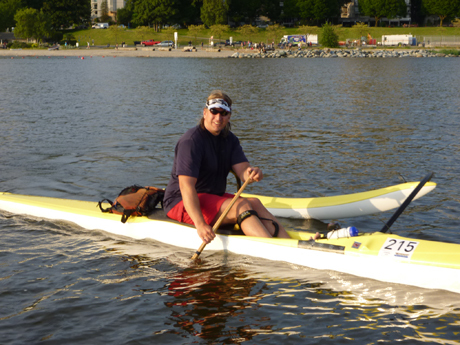 Deep Cove Kayaks owner, Bob Putnam, posted the fasted time -- a full minute ahead of Warren Bruce. In the Little Chop, Bob and Alison Campbell paddled their double kayak 2.5 minutes faster than Jeannette and Paul Hogan. 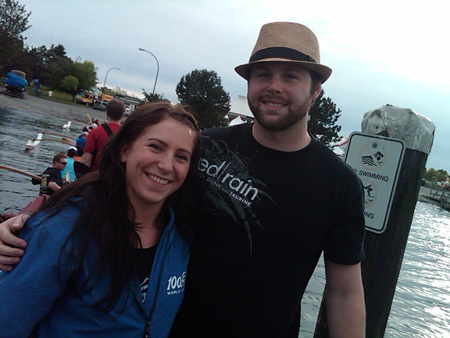 Gary Parsons and Shannon Bell, organizers of the Oceanman, beat four other SUPers. Be sure to signup for the Oceanman race on August 6th. 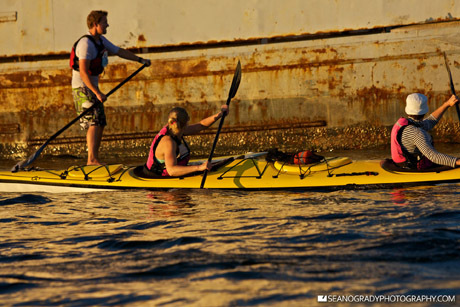 This is an awesome race where you swim, kayak, run and SUP. Race solo or in relay teams. Thanks again to everyone for coming out and a special thanks to the team of volunteers and sponsors! See you in two weeks! 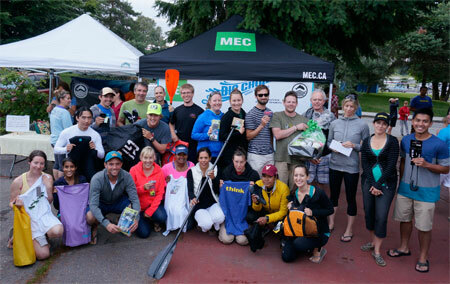 It was a small group out for the third race in the MEC Big Chop Summer Paddle Series as only 35 dedicated paddlers braved the cold and rain. The rain turned to a light drizzle during registration and pretty much stopped by the time the smokies were coming off the BBQ. Louise Bliss' dad from Australia was in town so she brough him out to experience his first Big Chop. 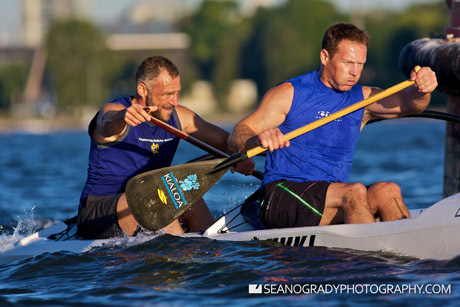 The aussie paddling duo outpaced everyone in the Little Chop and won it all with a time of 28:27. The SUPers had a nice battle going too with Bob Putnam edging out Shawn Campbell and Mike Darbyshire. In the Big Chop, Warren Bruce led all paddlers to victory in a time of 42:05. Rob Hansen was a mere nine seconds back. Ryan did the shopping tonight for the post race BBQ and it was a DELUXE meal with big smokies, fresh buns, and veggie platters (in addition to the chiips and cookies). 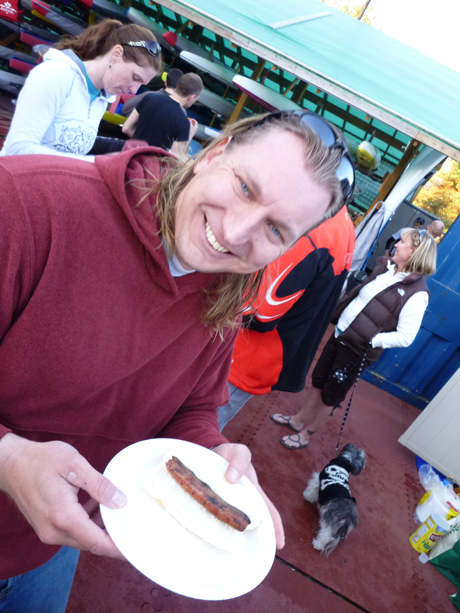 The Vancouver Ocean Sports volunteers did an exceptional job cooking the smokies to perfection! We didn't get any photos from tonight so instead, I pulled a graphic from Accent Paddles who are one of our awesome sponsors. The big box of carbon paddles arrived and we gave away our first one of the series. 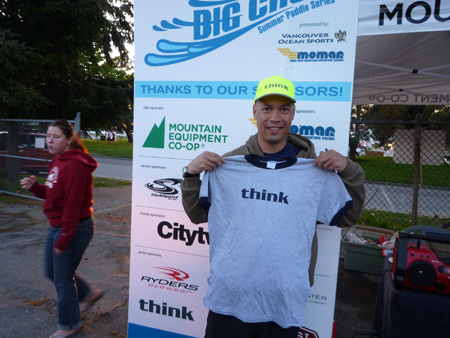 Brenda Power teamed up with co-Race Director, Bryan Tasaka, who took part in his first Big Chop ever. 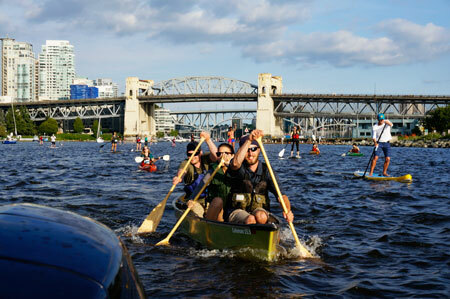 What a night with 78 paddlers on the water for the second race in the MEC Big Chop Summer Paddle Series. Not a cloud in the sky but the seas were a bit choppy which made for some great surfing and a lot of wet bums. Stig and Tyler from Level Six were in town from Ottawa and came out to the Big Chop with a whole schwack of product that we gave out at the awards. That made for a prize table filled with awesome swag in addition to product from MEC, Stolhquist, and Pogue Sports. 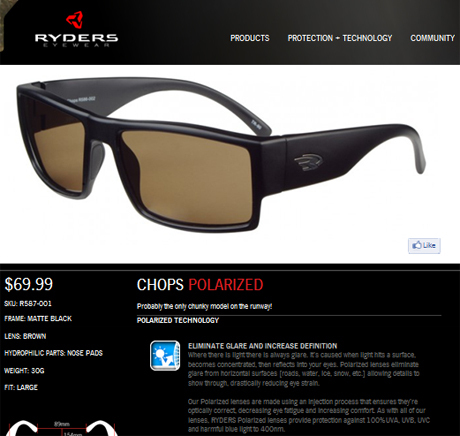 We'll have even more next week when our shipment of Ryders sunglasses and Accent Paddles arrive! 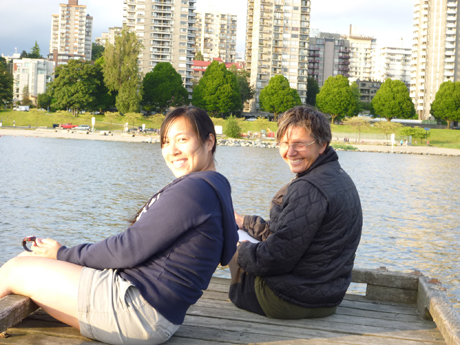 A big THANKS to our awesome volunteer team of Jeannie, Dave, Julie, Jane, and the MEC crew! 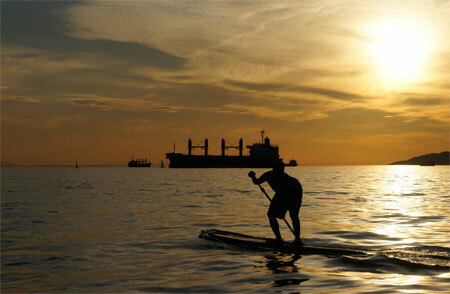 The MEC Intro Paddling Session had 10 paddlers out there too. If you have friends that would like to try out kayaking, please let them know that MEC is offering free sessions prior to each Big Chop! 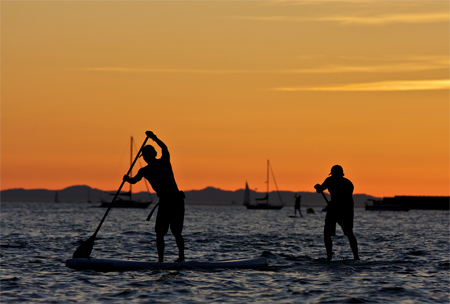 Lots of SUP on the water tonight. 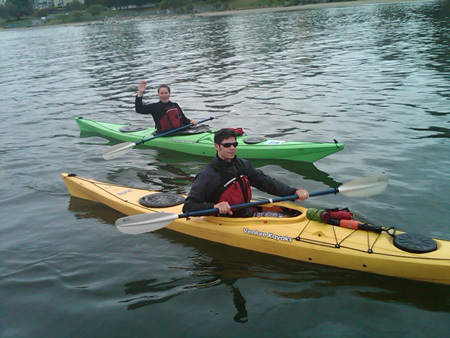 Dan Wong and Kyle Suave doing some canoe training for the Raid the North Extreme in July. Natalie and Paige were newbies to the Big Chop two weeks ago and they had some much fun that the came back for more tonight! 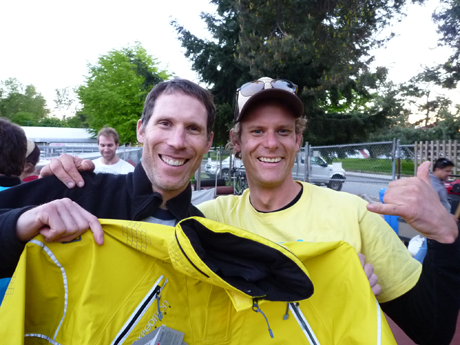 Chris D won the grand prize of the night -- a wicked paddle jacket from Level 6. Ryan wants it. Shane Martin with his 'dog. 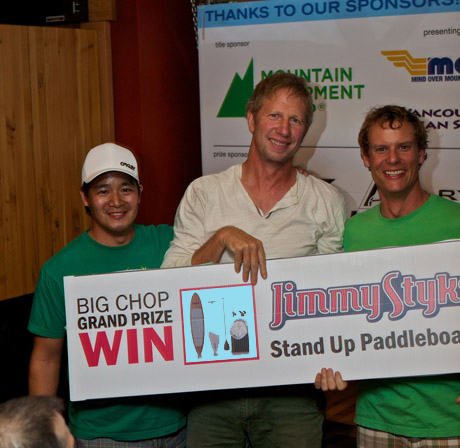 Stand Up Paddleboarding is all the rage and the Big Chop is excited to announce that we'll be giving away a complete Jimmy Styks setup as our Series Grand Prize. 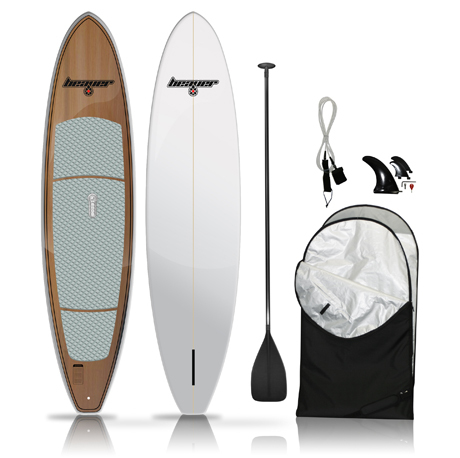 This package comes with the board, paddle, bag, and accessories. Big thanks to our friends at MEC helping put this together. We'll give it away at our year end party at Rocky Mountain Flatbread Company. And remember that for every Big Chop you do this year, you get one entry into the final draw! We do have five SUP for rent too so come on out and give it a try! 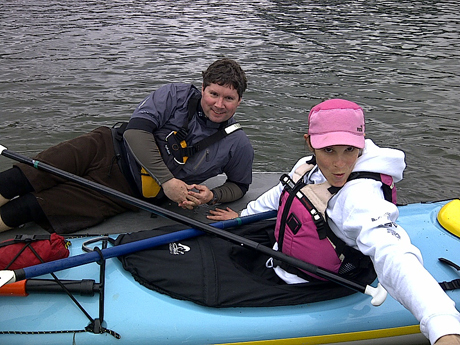 MEC's Mark Kelly and Stohlquist athlete, Kimberly Hall, "workin' it." 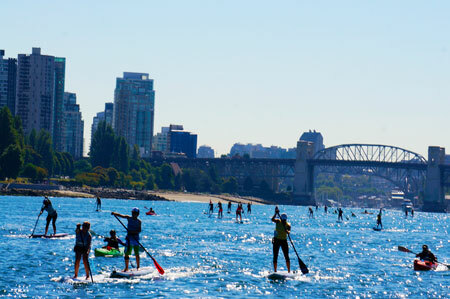 We were up against some sketchy weather and game four of the Canucks vs Predators so we didn't expect to see that many paddlers out for the first race in the MEC Big Chop Summer Paddle Series. Boy, were we wrong! 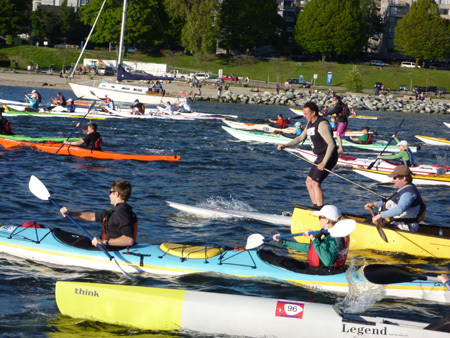 We were very surprised to have close to 50 paddlers on the start line with great mix of boats from outriggers to kayaks, to surfskis, and stand up paddleboards. Shane Martin was the fastest paddler on the Big Chop course tonight despite saying that he's been working too much and not paddling enough. 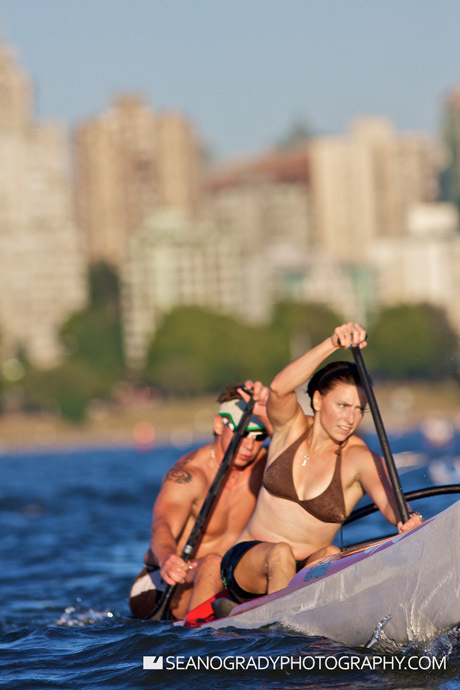 George Power and Ester Power ripped up the Little Chop complete with a huki in the frigid waters of English Bay. We have officially addded a Stand Up Paddleboard (SUP) category to the race this year and we had seven SUPers (is that the right word?) taking part in the inaugural race. Nice work to Mike Derbyshire for not only having the fastest SUP time, but also the second fastest time in the Little Chop! Wow! Thanks to all the VOS volunteers, MEC staff, and racers for coming out tonight. We'll see you all in two weeks! Look for photos and video coming soon to the Big Chop Facebook Fan Page. 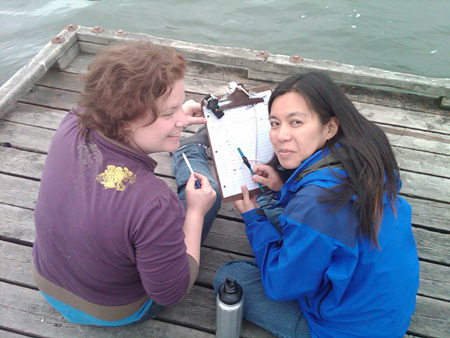 Volunteers - Teresa and Robyn - start it up. 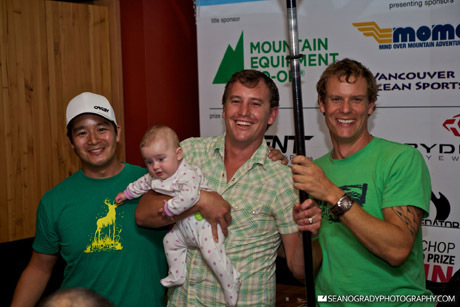 CLUB NIGHT AT MOUNTAIN EQUIPMENT COOP! 10% OFF! Paddle season will be soon be upon us and to get you thinking about getting out on the water, we are hosting a Club Night at Mountain Equipment Coop. The date is Tuesday, March 1st, from 7:00 to 9:00pm, at the Vancouver location at 130 West Broadway. We have partnered with the 5 Peaks Trail Running Series and the Yeti XC Snowshoe Series so we're hoping for a good turnout. This is event is by invite only, but it is open to anyone who has participated in any one of the three events. The store will be closed so you must be on the list to get in. Once you're in, you get 10% off all items purchased that evening and 5% off bikes and boats. Note that you must be a member of Mountain Equipment Coop in order to make a purchase. If you are not yet a member, you may purchase a 5$ membership that evening. Please RSVP to info@bigchop.ca by Sunday February 27th, if you are planning to attend. The final Big Chop of the season is coming up on Thursday, Sept 2nd, and we hope to see a big turnout for this one. We only have a few single kayaks to rent so if you may need to call Ecomarine to see if they will rent you a boat for the night. We still have tickets available at registration for the wrap up party at the Rocky Mountain Flatbread Company. We'll be giving away a ton of great draw prizes including 4 pairs of Ryders sunglasses, a Stohlquist PFD, 4 Lasso locks, a entry to the Mind Over Mountain Adventure Race, and our grand prize a Think PowerWing paddle! I have posted the results from Race #9 and there are photos on the Big Chop Facebook Page too. THE BIG CHOP HAS A FACEBOOK PAGE. BE A FAN. Join the Big Chop on facebook and be our friend. I'll post the full set of photos there too. Click here to be a fan. 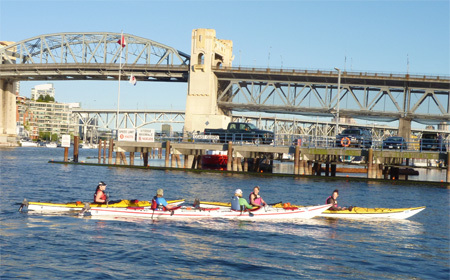 Once again, the kayakers were the majority on the waters of False Creek and more seem to be content to participate in the Little Chop. 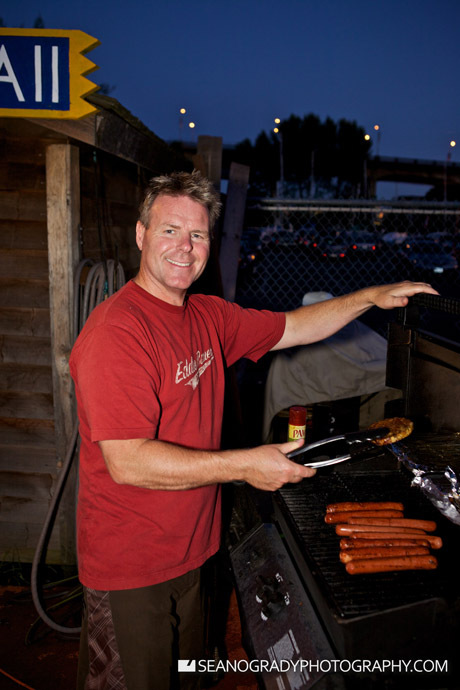 I think it might have something to do with getting the 'good table,' the coldest beer, and the freshest hotdogs. Am I right, or am I right? Thanks to Sophia Ha for coming out to shoot the Big Chop with her BIG camera. Once she sends me the photos, I'll post them up to the Big Chop's Facebook page. REMINDER: We will be selling tickets to the Big Chop's Year End Party starting at the nextt race on August 5th. Tickets are $15 and they always sell out early. More details will be posted on this blog as we firm up more details. Bring extra cash to the next race. FINALLY! This is the kind of weather we've been waiting for all year! Tomorrow's Big Chop is going to be the place to be with cool ocean breeze followed by a cool beverage drink! We hope to see you all out there for the sixth race of the season. Sorry for the delay in posting week #3's results and photos! The resutls are on the right and here are few photos from the blackberry! 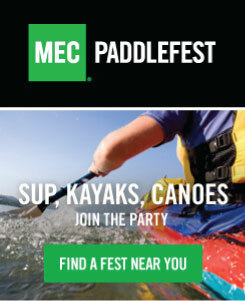 MEC PADDLEFEST CELEBRATES ALL THINGS PADDLING. 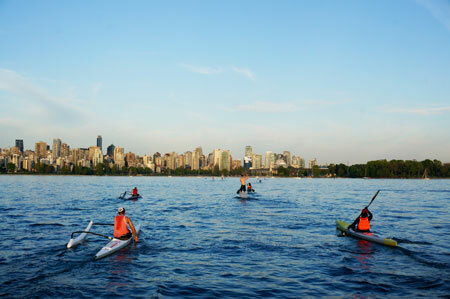 Paddlefest is a series of urban paddling events developed by MEC to support the enjoyment, growth and safe practice of paddling sports across Canada. 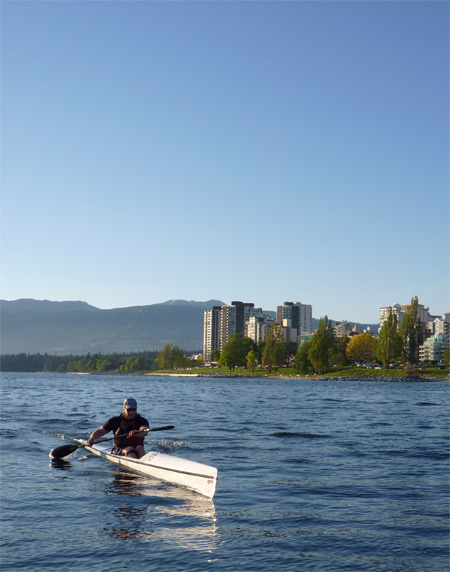 The Vancouver event will feature water and on-land workshops, along with the possibility to try out boats from different manufacturers. 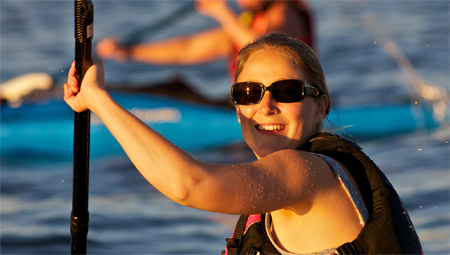 New this year: a Paddleswap to exchange new and used gear. 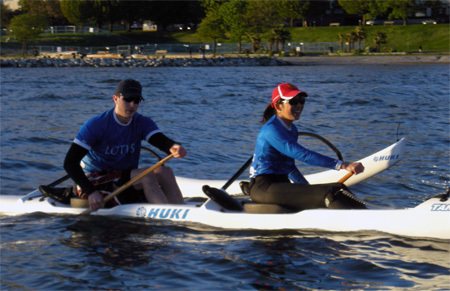 Capacity is limited, and paddlers wanting to participate are encouraged to pre-register. SUMMER ARRIVES JUST IN TIME FOR THE BIG CHOP. Had the Canucks won game six, it would have put game seven on the same day as last night's Big Chop. Lucky for us that didn't happen because I'm sure all of you would rather paddle than watch the Canacks battle it out one more time? 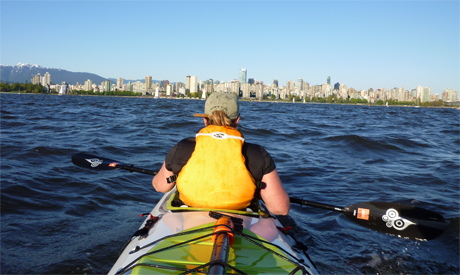 It was perfect paddling weather for all abilities and we sent everyone out on the Backside Loop course for a 8km or 4km adventure. 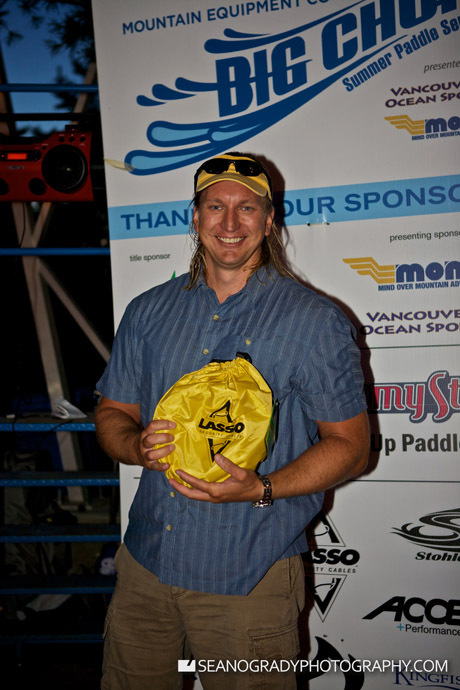 Warren Bruce was the fastest paddler in the Big Chop. Selina, George, and a friend volunteered to time the finish. Thanks to you guys and to Dave, Deanna, Florida, Hugh, Melissa, and all the MEC staff for volunteering your time! 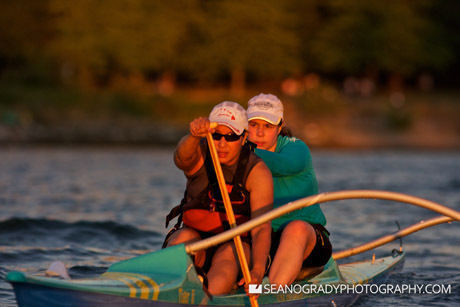 It was an exciting battle in the Little Chop between the female racers. Team Fab (Kimberly Hall and Liz Scott) squeaked out the win over Brenda and Nancy who tried to 'quietly' sprint it out but just missed out. 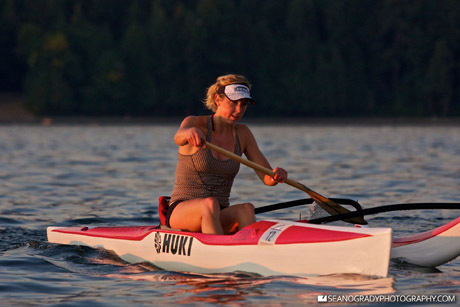 Solo paddler Sarah Newman also competed for the top spot. Shane Martin cruises to second place. 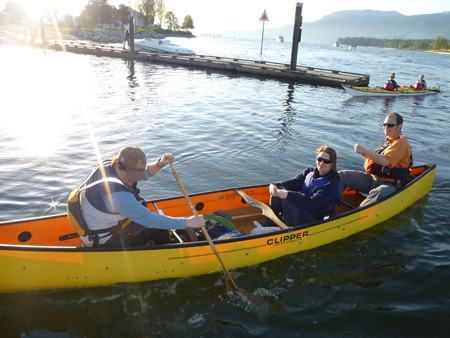 MEC's Mark Kelly and North Water's Morgan Goldie take Trish for a ride in circles. 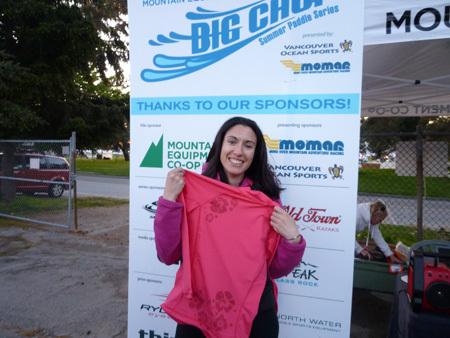 Louise Bliss was the lucky winner of the pink top from MEC. Liz Scott wins two tickets to EAT! 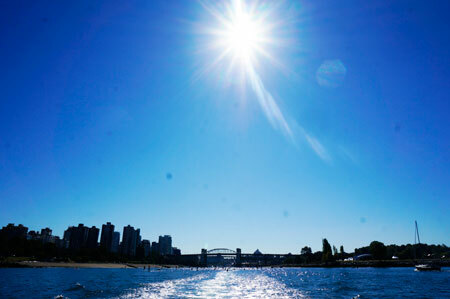 Vancouver which is coming to the Vancouver Convention Centre on May 28-30th. Brian Page wins the Think prize package. More photos are posted on the the Big Chop Facebook Fan page. CHOPPY AT THE CHOP. FIRST BIG CHOP SEES WHITECAPS. 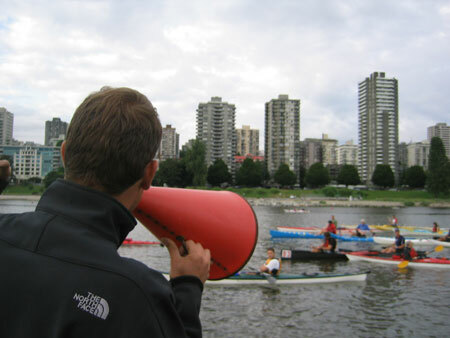 Ryan Pogue belts out the course route instructions to the 48 paddlers on opening night of the MEC Big Chop Summer Paddle Series. The windy weather conditions meant that we had to go the 'creek' route which avoided the big waves for the Little Choppers. Ryan still had the Big Choppers go out to the Red Can for a bit of the swells and everyone was extra cautious making that turn. 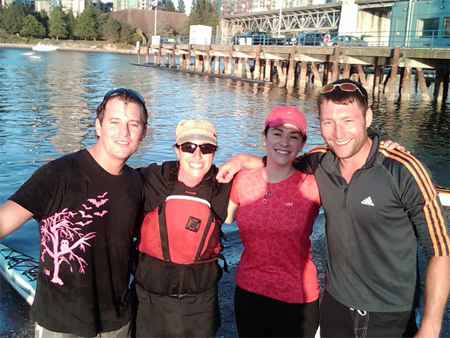 Little Chop regulars, Kimbery Hall and Liz Scott (above), sporting the pink Stohlquist PFDs, were the fastest team in double kayak category. Bruce Passmore in an OC1 won the Little Chop overall and Shane Martin won the Big Chop. Full results on the sidebar. 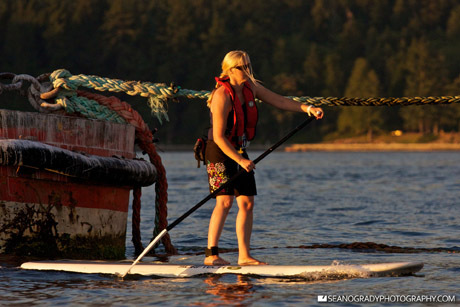 Professional endurance athlete and course director for the Squamish Mind Over Mountain Adventure Race, Jen Segger, made the trip down from Squamish to take on the Little Chop on her Stand Up Paddleboard (SUP). Norm Hann also made the trip and did the Big Chop on his SUP. 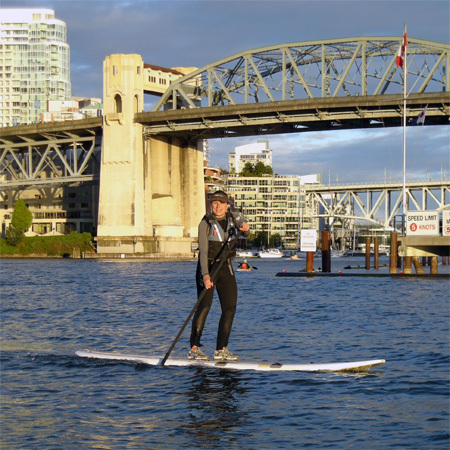 Starting on May 3rd, Norm will be paddling his SUP from Kitimat to Bella Bella to raise awareness to the proposed Enbridge oil pipeline and tanker traffic and its potentially devastating effects to the traditional food harvesting areas of First Nations and wildlife of the Great Bear Rainforest. We wish Norm all the best on his 300km journey! Louise Bliss (above) took in her first Big Chop and liked it so much that she's already booked her kayak for next week! Jamie Westell and Grace Morissette finished 6th overall in the Big Chop course. THE BIG CHOP IS BACK ON FOR 2010! Over the past few months, Ryan has been Hawaii and I have been working on the Olympics, but during that we managed to exchange a few emails and put some effort into this year's Big Chop season. We have set the schedule and we have secured Mountain Equipment Co-op for another season! Our first event of the 10 race series, kicks off on Thursday, April 29th, at 7:00pm and continues every two weeks thereafter until we hit the final race on Sept 2nd. 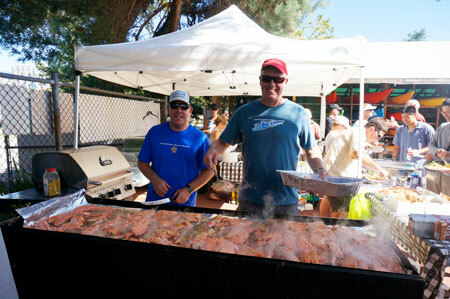 We'll clean off the BBQ, dust of the kayaks, and we ensure the prize table is filled with lots of swag every race. Please help us spread the word of the Big Chop to your friends. 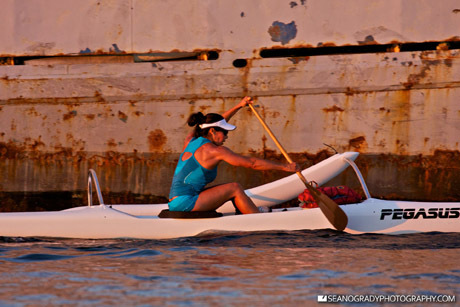 We would love to see more paddlers out there -- both newbies and speedsters. Stay tuned for futher announcments of our grand prizes and other details about series pass registration incentives. All results can be found on Webscorer.